Blog-checking lines: The February 2011 Daring Bakers’ challenge was hosted by Mallory from A Sofa in the Kitchen. She chose to challenge everyone to make Panna Cotta from a Giada De Laurentiis recipe and Nestle Florentine Cookies. I added a teaspoom of almond extract to my Panna Cotta, but I didn't like the result. It was too strong for such a delicate cream. I also chose 4 different jams to mix with Panna Cotta: Apricot, Orange, Wild Rose and Rosmary. Apricot and orange jams worked far more better then the others ( too sweet). Unfortunately I was too anxious to see the final results of all of this and added the apricot jam a bit early. The panna cotta was not fully fixed and everything mixed up. Not beautiful, but very tasty indeed. Thanks to Mallory for this challenge. It was one of the most easy and quick ones which was a bless in this hot, hot hot summer we are having here in Brasil. And, as always, I had a lot of fun being part of this. Blog-checking lines: The February 2011 Daring Cooks’ challenge was hosted by Lisa of Blueberry Girl. She challenged Daring Cooks to make Hiyashi Soba and Tempura. She has various sources for her challenge including japanesefood.about.com, pinkbites.com, and itsybitsyfoodies.com . Heat 2 liters of water to a boil in a large pot over high heat. Add the noodles a small bundle at a time, stirring gently to separate. When the water returns to a full boil, add 1 cup of cold water. Repeat this twice. When the water returns to a full boil, check the noodles for doneness. You want to cook them until they are firm-tender. Do not overcook them. 2 cups Kombu and Katsuobushi dashi (recipe HERE.) Or a basic vegetable stock. I've cut the bell peppers, the onions, the spring onions and the shitake mushroons in julienne style and stir-fried everything in a Wok pan. I also made a Fig Tempura and served with Passion fruit (yellow) and Brazilian Berry (jabuticaba - purple) ice creams. This was another amazing challenge. Many thanks to Lisa. I loved being part of this! 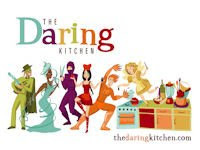 Don't forget to visit The Daring Kitchen website and check what great work my fellows had done. Blog-checking lines: The January 2011 Daring Bakers’ challenge was hosted by Astheroshe of the blog accro. She chose to challenge everyone to make a Biscuit Joconde Imprime to wrap around an Entremets dessert. Variations allowed: We could use any fillings for your entremets. We could use store bought fillings, to save time, or make homemade. The real task here was making the joconde wrap properly in a beautiful molded dessert presentation. You may be asking what is this Joconde Imprime? Despite the difficult name, making it is not difficult al all. Just follow these few steps and everything will be done. Cream butter and sugar until light and fluffy (use stand mixer with blade, hand held mixer, or by hand). Gradually add egg whites. Beat continuously. Fold in sifted flour. Tint batter with coloring to desired color, if not making cocoa variation. In a clean mixing bowl whip the egg whites and white granulated sugar to firm, glossy peeks. Reserve in a separate clean bowl to use later. Sift almond flour, confectioner’s sugar, cake flour. (This can be done into your dirty egg white bowl). On medium speed, add the eggs a little at a time. Mix well after each addition. Mix until smooth and light. (If using a stand mixer use blade attachment. If hand held a whisk attachment is fine, or by hand). Fold in one third reserved whipped egg whites to almond mixture to lighten the batter. Fold in remaining whipped egg whites. Do not over mix. Fold in melted butter. Reserve batter to be used later. Spread a thin even layer of décor paste approximately 1/4 inch (5 millimeter) thick onto silicone baking mat with a spatula, or flat knife. Place mat on an upside down baking sheet. The upside down sheet makes spreading easier with no lip from the pan. Pattern the décor paste – Here is where you can be creative. Make horizontal /vertical lines (you can use a knife, spatula, cake/pastry comb). Squiggles with your fingers, zig zags, wood grains. Be creative whatever you have at home to make a design can be used. OR use a piping bag. Pipe letters, or polka dots, or a piped design. If you do not have a piping bag. Fill a ziplock bag and snip off corner for a homemade version of one. Slide the baking sheet with paste into the freezer. Freeze hard. Approx 15 minutes. Remove from freezer. Quickly pour the Joconde batter over the design. Spread evenly to completely cover the pattern of the Décor paste. Bake at 475ºF /250ºC until the joconde bounces back when slightly pressed, approx. 15 minutes. You can bake it as is on the upside down pan. Yes, it is a very quick bake, so watch carefully. Cool. Do not leave too long, or you will have difficulty removing it from mat. Flip cooled cake on to a powdered sugared parchment paper. Remove silpat. Cake should be right side up, and pattern showing! (The powdered sugar helps the cake from sticking when cutting). Trim the cake of any dark crispy edges. You should have a nice rectangle shape. Decide how thick you want your “Joconde wrapper”. Traditionally, it is ½ the height of your mold. This is done so more layers of the plated dessert can be shown. However, you can make it the full height. Once your height is measured, then you can cut the cake into equal strips, of height and length. (Use a very sharp paring knife and ruler). Make sure your strips are cut cleanly and ends are cut perfectly straight. Press the cake strips inside of the mold, decorative side facing out. Once wrapped inside the mold, overlap your ends slightly. You want your Joconde to fit very tightly pressed up to the sides of the mold. Then gently push and press the ends to meet together to make a seamless cake. The cake is very flexible so you can push it into place. You can use more than one piece to “wrap “your mold, if one cut piece is not long enough. The mold is done, and ready to fill. *Note 1: If not ready to use. Lay cake kept whole or already cut into strips, on a flat surface, wrap in parchment and several layers of cling wrap and freeze. *Note 2: As I had some Joconde Sponge and Decor Paste leftover, I repeated the whole process and baked over another rectangle of biscuit. When ready I cut a circle the same diameter of my spring form pan ring and lined the bottom of the pie with it. Then it was ready to receive the filling. I chose a lime cream and a chocolate mousse as fillings. Mix well and pour over bottom of pie. Refrigerate until firm. This is the same recipe of the Chocomint Terrine I did at the first dinner of the Laboratory, whose theme was Terrines. Beat eggs with sugar, mix the mint liqueur and set aside. Place chocolate and butter in a baking dish and melt in double boiler (or microwave minutinhos 5). Add the beaten eggs mixing gently, without stirring. Pour chocolate mixture over the lemon cream. Spread over some of the almonds and top with another layer of chocolate. Place in the freezer for about 10 hours (preferably overnight). Serve cold. If you have paid attention, you may have noticed that at the end of all this game, there was 10 egg yolks left over. Hence I decided to test a recipe of Quindão (Brazilian traditional dessert, with egg yolks, sugar, coconut and/or cheese) which I found in an old magazine. Mix the egg yolks, egg whites and sugar. Add the grated coconut and butter and stir well. Grease the pan and sprinkle with granulated sugar. Pour the batter in it. Arrange the pan on a roasting pan with boiling water and bake in water double bath, in preheated oven for about an hour (actually my Quindão took 1 hour and a half). Umold when fully cold. To be honest, I did not like it. I prefer the old recipe of my mother and grandmother, but that is something for another post. I had also a good Decor Past leftover. So I made a plain white cake and roughly mixed the Decor Past with it. I got a kind of "marble" cake. Yummy. Many thanks to Astheroshe of the blog accro for pushing me out of my confort zone with this really amazing challenge. I learned a lot with this Joconde Imprime and I'll be doing this again and again. Mandatory: We should make a confit and incorporate it in to a cassoulet. Variations: We might choose to use any combination of meat or other protein source that we wished. We were also encouraged to soak our own beans, but we could use canned beans as well. If we couldn’t find duck, we could substitute with any other waterfowl/poultry. Same goes for any of the pork, we could substitute with lamb, beef, and venison, or whatever we wished. If we couldn’t find duck fat, we could substitute any other fat that we wanted, i.e. bacon grease, lard, butter, olive oil, etc. Pork rind could be substituted with slab bacon or we could purchase salt pork and cut off the rind. Sea salt, for the overnight (at least 6-8 hours) dry rub (the amount varies depending on the size of your legs, so just know that you need to have enough on hand for a good coating). Rub the duck legs fairly generously with sea salt, place in the shallow dish, cover with plastic and refrigerate overnight. At all times, keep your work area clean and your ingredients free of contamination - meaning don't allow any other food, like bread crumbs or scraps, to get into your duck, duck fat or confit, as they will make an otherwise nearly non-perishable preparation suddenly perishable. Preheat the oven to moderately hot 375ºF/190ºC/gas mark 5. Render (melt) the duck fat in the saucepan until clear. After seasoning with the black pepper, place the duck legs in the clean, ovenproof casserole. Nestle the thyme, rosemary and garlic in with the duck legs, and pour the melted duck fat over the legs to just cover. Cover the dish with foil and put in the oven. Cook for about an hour, or until the skin at the "ankle" of each leg pulls away from the "knuckle." The meat should be tender. Allow to cool and then store as is in the refrigerator, sealed under the fat. When you need the confit, you can either warm the whole dish, in which case removing the legs will be easy, or dig them out of the cold fat and scrape off the excess. I highly recommend the former. A nice touch at this point is to twist out the thighbone from the cold confit. Just place one hand on the drumstick, pinioning the leg to the table, and with the other hand, twist out the thighbone, plucking it from the flesh without mangling the thigh meat. Think of someone you hate when you do it. Ok, let me tell you something. Here in Brasil it is easy to find whole duck to buy. You can find it in almost every supermarket. But just the whole bird. I've never seen it been sold in separate parts. So I bought and used legs and tights of chicken. Place the beans in the large bowl and cover with cold water so that there are at least 2 or 3 inches (50mm or 75mm) of water above the top of the beans. Soak overnight. Drain and rinse the beans and place in the large pot. Add the pork belly, the quartered onion, 115g of the pork rind, and the bouquet garni. Cover with water, and bring to a boil. Reduce to a simmer and cook for about 30 minutes. Season with salt and pepper to taste and continue to simmer until the beans are tender, about 30 minutes more. Let cool for 20 minutes, then discard the onion and the bouquet garni. Remove the pork belly, cut it into 5cm squares, and set aside (If you plan to wait another day before finishing the dish, wait to cut the pork belly until then). Strain the beans and the rind and set aside, reserving the cooking liquid separately. In the sauté pan, heat all but 1 tablespoon of the duck fat over medium-high heat until it shimmers and becomes transparent. Carefully add the sausages and brown on all sides. Remove sausages and set aside, draining on paper towels. In the same pan, over medium-high heat, brown the sliced onions, the garlic and the reserved squares of pork rind from the beans (not the unused pork rind; you'll need that later). Once browned, remove from the heat and transfer to the blender. Add 1 tablespoon of the remaining duck fat and purée until smooth. Set aside. Preheat the oven to moderate 350ºF/180ºC/gas mark 4. Place the uncooked pork rind in the bottom of a deep ovenproof non-reactive dish. You're looking to line the inside, almost like a pie crust. Arrange all your ingredients in alternating layers, beginning with a layer of beans, then sausages, then more beans, then pork belly, beans, duck confit and finally more beans, adding a dab of the onion and pork rind purée between each layer. Add enough of the bean cooking liquid to just cover the beans, reserving 1 cup/240 ml in the refrigerator for later use. Cook the cassoulet in the oven for 1 hour, then reduce the heat to very slow 250ºF/130ºC/gas mark ½ and cook for another hour. Remove from the oven and allow to cool. Refrigerate overnight. Preheat the oven to moderate 350ºF/180ºC/gas mark 4 again. Cook the cassoulet for an hour. Break the crust on the top with the spoon and add 1/4 cup of the reserved cooking liquid. (Don't get fancy. Just pile, dab, stack and pile. It doesn't have to be pretty). Reduce the heat to very slow 250ºF/130ºC/gas mark ½ and continue cooking another 15 minutes, or until screamingly hot through and through. Then serve. As this challenge was about confit too I decided to make two other confits: garlic and tomatoes confit. Put all ingredients together in a small pan and take to a very low heat. Cook it for 1 to 2 hours but don't let it boil. I also made another tomato confit, using Italian tomatoes, cut in small dices. I made four chicken legs confit but used only two in the Cassoulet. The other two I fried in its own fat and served with the garlic and tomato confit. Really good! This was an amazing challenge. I learned﻿ and enjoied it a lot. Thanks Lisa and Jenni. Ok! With this post I finally finish the year 2010. This cake "happened" on December, 31st. My daughters were on vacation, traveling with my parents. My husband was working, on duty until midnight. Alone at home, I wanted to eat a cake and at the same time, do something nice to wait for the New Year. - "Uh, I have some packets of different types of nuts staring at me from the back of the first shelf. Some Brazil nuts, cashew nuts, peanuts, almonds and walnuts. Oh, there's also some dried apricots, raisins and dried cramberries. Great!" - "Grab an electric mixer, let's have cake. Wait! I stil lhave a bit of brown sugar. So it would taste good with a pinch of cinnamon and ginger. And what if I add some brown butter to it? I think it would be very good. It was like that. I gathered all these things and the cake came out. I soaked the dried fruits into an orange liqueur and ... done! My cake was perfect. Beat the eggs at high speed until doubled in volume. Add the sugars by spoonfuls, stirring constantly, until mixture is white. Add the vanilla and the almond extract and continue beating. Add the cinnamon, the ginger and the mix of nuts. Reduce the mixer speed and proceed slowly adding the corn, alternately with the milk until everything is well incorporated. Add the melted brown butter. Stop the mixer and add the yeast. Mix gently with a spoon or spatula. Bake in moderate oven, 180 º C, in a greased and floured baking pan. Bake for 30 min. or until a toothpick stuck in the dough, get completely clean. Kutna Hora is a small town located an hour and half drive from Prague. During 13th century this was the second most important city in Bohemia, on account of its silver mines. From16th century mines were being depleted, and with them the importance of the place. Cute! Its main attraction is the church of St. Barbara, patroness of miners. A few more pictures from the trip to Hungary, Czech Republic, Slovakia and Turkey. This time the photos are from Prague. The city, like Budapest, is crossed by a river, the Vltava. The east part of town is where we find the Old Town (Staré Mesto) and the New Town (Nove Mesto). It is also the most crowded with tourists. This is where you can find the famous astronomical clock, the Jewish quarter, with the oldest synagogue in Europe, the cafes and restaurants, the main shopping streets. On the other hand there is the Prague Castle, at the top of the hill, and the Lesser Town (Mala Strana), best preserved historic district of the city.